Las Posas wasn’t big. It was bigger. “The $47-million project near Moorpark will hold more water than Lake Casitas and nearly four times what Lake Piru holds,” reported the Times. Until it didn’t. When last month the Ventura County Reporter recounted that the capacity proved to not be the much-celebrated 300,000 acre feet, but instead 50,000 acre feet, no villain was named. Who needs a villain when, as the Reporter ran a rough tally, the cost borne by a water district serving 620,000 people exceeded $53 million? As it happened, when earlier this week I decided to put up a brief post connecting the early enticements made about Las Posas and a new generation of stunningly high estimates to do with a project best known simply as Cadiz, the fleecing of Ventura County was not on my mind. Orange County was, where a municipal water company has signed on to front the Cadiz project. San Bernardino County was, where the Cadiz target basin is located in the dry Mojave. All it took to get me wondering aloud about the hard landing that the Ventura County rate payers covered by Calleguas suffered in the Las Posas venture was the chance observation that Las Posas shares a hydrologist with Cadiz. Cadiz has convinced the Rancho Santa Margarita Water District, an Orange County water company only a fraction the size of Calleguas, to go a-prospecting in the San Bernardino desert. Like Calleguas, Rancho Santa Margarita Water District is big enough to be credible, but small enough to be credulous. If only by coincidence, it’s been using hydrological estimates from the same man who consulted Calleguas. 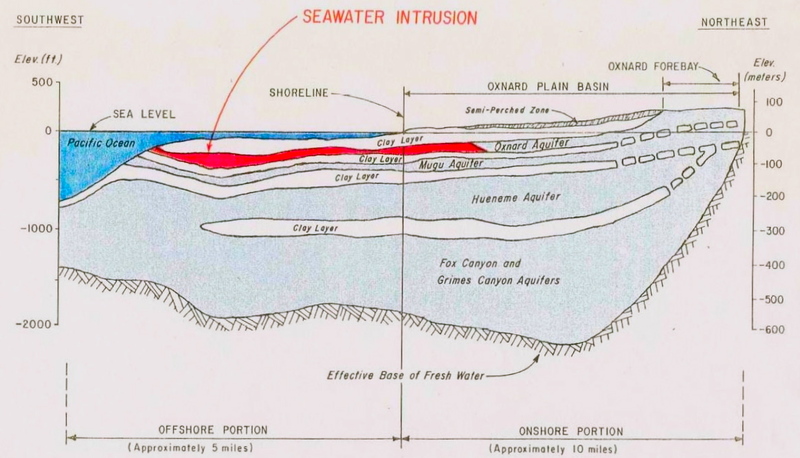 So, in that earlier post this week, rightly or wrongly, and at least one person has shouted, “Wrongly!”, I insinuated that Terry Foreman, a hydrologist with the Ventura branch of the engineering giant CH2M Hill, not just exaggerated the potential for Cadiz, but was also a serial exaggerator. This drew a sharp comment from someone who at this point every reporter instinct that I possess tells me is a good woman cleaning up a bad mess. She is Calleguas general manager Susan Mulligan. Her comment may be viewed here. This post is my response. First, I’d like to thank Ms Mulligan for commenting, then freely corresponding by e-mail. Second, in response to her charge that I used two articles from the Ventura County press to illustrate that hydrologist Terry Foreman “provided bad science and engineering,” there is no other response than to say, “Yes.” I did suggest that Mr Foreman provided bad science and engineering on Las Posas, as to my eyes he is vividly doing with Cadiz. If his work on Las Posas was elegant but misused by others, I apologize not just wholeheartedly but also abjectly. At the time of writing, however, I can only make way for ballooning uncertainty. I can see no way that Don Kendall, if he was to blame at all for the Las Posas exaggerations, could have sold the inflated project by himself. Are we to assume that Kendall alone went into Metropolitan Water District of Southern California with a sales pitch and came out with $25m cash and another roughly $20m worth of water? He had to have presented the biggest water wholesaler in the West outside of the federal Bureau of Reclamation with compelling models. With data. A lot of people started dreaming the 300,000 acre foot dream. If Mr Foreman, the hydrologist of record on the project, wasn’t the provider of the enlarged estimates, then who was? The technical memorandum provided by Ms Mulligan refers to CH2M Hill models done for Calleguas and Metropolitan from 1993 onwards. These and their accompanying documents should be studied. “Quite clear” to some can resemble mud to others, but the memorandum does stress uncertainties. It does stand to reason that if you pump groundwater, the water table falls. It also seems obvious that if you inject water into the ground, there is less room for infiltration when it rains. Which begs the question: If the project limitations were clear back in the day, why did the project proceed? No nods in Mr Kendall’s direction suffice here either to condemn him or defend his hydrological consultant, Mr Foreman. Back to the blog post that provoked this: I confirm that the sole purpose of the first post was to link the Ventura articles to the Cadiz project. Otherwise, they easily could have been missed by the directors of the Rancho Santa Margarita Water District as it parses the pros and cons of the Cadiz project being sold by, among others, Mr Foreman. Given the onerous price that Ventura paid, it seemed the civic-minded thing to do to give Orange County and the target San Bernardino County communities the nod about the track record of the consultant on the Cadiz project. This, Ms Mulligan stresses, has been immaculate. “We are totally satisfied with his work and have complete confidence in the groundwater analyses and recommendations that he and his firm provided to Calleguas,” she wrote in the post comment box. This is precisely why I put up a post about it as it relates to Cadiz, though at no time as the comment indicates did I refer to it as a “failure.” I wholeheartedly accept Ms Mulligan’s contention that storage of 50,000 acre feet is not a wash. But if you pay for 300,000 acre feet, it’s arguably 5/6ths of one. If the modeling behind Las Posas was only 1/6th right, or had a 5/6ths margin of error, then we’re talking a $44 million over-estimate. The USGS should be brought in to test his assumptions before Rancho directors certify the Cadiz DEIR. If Mr Foreman, like Calleguas, like the 630,000 ratepayers, was the victim of an as yet un-named maverick in the Las Posas affair, Rancho Santa Margarita should know his vulnerabilities. Even if he wasn’t wrong about Las Posas on paper, it still went 5/6ths wrong in the field for reasons that remain murky. If Mr Foreman’s work is good, isn’t the best insurance against calamity with Cadiz impartial review of the hydrology as he presents it by the USGS? Only the USGS should do it because it is their model Mr Foreman purports to use on Cadiz to arrive at recharge estimates that are, according to other USGS estimates, wildly high. Isn’t the best insurance against repeating the mistakes of Las Posas checking the Cadiz project numbers before drilling and not after it? 5/12/2012, 11.45am: This post has been updated.